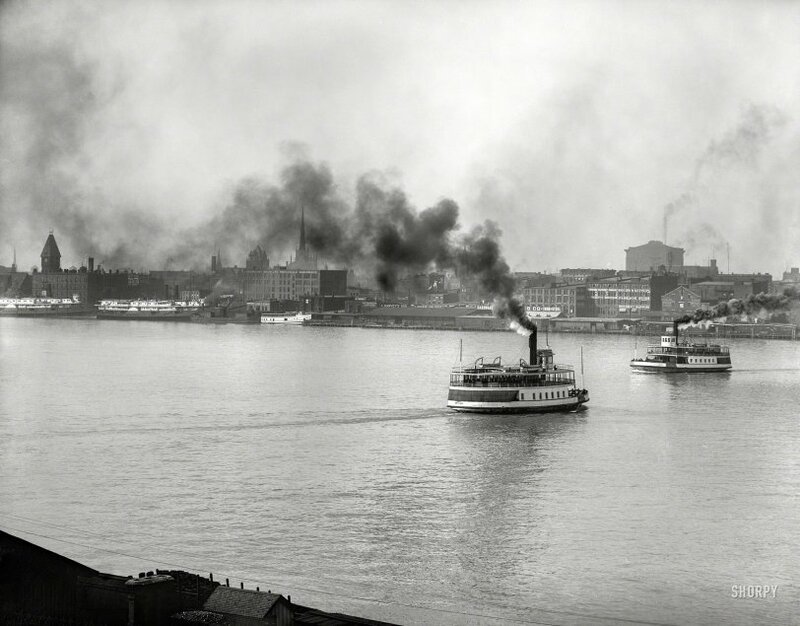 The Detroit River circa 1910. "Detroit waterfront." When Ferry met Sooty. 8x10 inch dry plate glass negative, Detroit Publishing Company. View full size. Submitted by bworden on Mon, 05/14/2018 - 7:56am. The ferry on the right is the Victoria of 1872. The Ariel was a Walkerville ferry and would not have been operating this far downriver. The D&C sidewheeler with two stacks abreast is the City of St. Ignace, ex City of Cleveland of 1886, renamed in 1907. Astern of her is one of the twins of 1893. 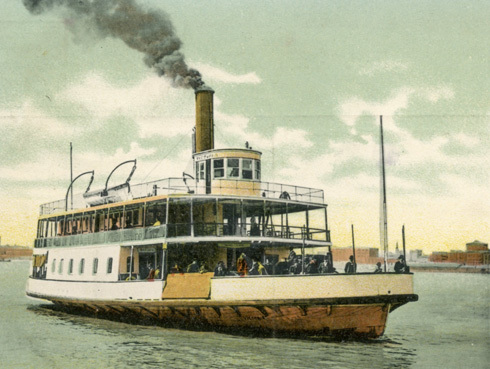 The use of an overhand at the main deck on excursion steamer and ferries was so common on the Great Lakes and in coastal and inland waters that it has to be regarded as a standard practice. As William Lafferty has noted, naval architects were quite competent in calculating safe levels of stability. Submitted by William Lafferty on Sun, 05/13/2018 - 10:43am. from left to right, the Excelsior, built 1876, and the Ariel, built 1881. Both were screw-driven. The metacentric heights of their hull design were calculated to lessen greatly the chance of capsizing by shifting passenger loads on the decks. Indeed, one of the witnesses into the inquiry of the Eastland disaster was Dr. Herbert Sandler, a professor of naval architecture at the University of Michigan who testified about metacentric heights and their importance to buoyancy, and who was a consultant to the Detroit, Belle Isle & Windsor Ferry Company, owners of these ferries. Submitted by archfan on Sun, 05/13/2018 - 1:53am. Submitted by StefanJ on Sun, 05/13/2018 - 12:49am. Those ferries on the river somehow can't deny their sidewheel paddle steamer heritage, although they seem to have been designed for propellers. At least I was wondering at first, where's the froth from the side wheels? Looking at the overhung decks I wonder what would happen if a full complement of passengers would crowd at one side.